The Acer U5 Series can project a 77" image from an amazingly short distance of just 13 cm, thanks to a specialized projection optical route. The ultra-short-throw feature offers greater installation flexibility and viewing comfort, while 3D capability and color technologies deliver impressive presentations and immersive learning. And to enhance productivity, networked management tools provide remote monitoring, control and reporting systems. The native XGA resolution plus high brightness and contrast ratio depict precise details, and the DLP® 3D kit featuring 3D glasses enable flicker-free stereoscopic visuals with a qualified PC or 3D player. 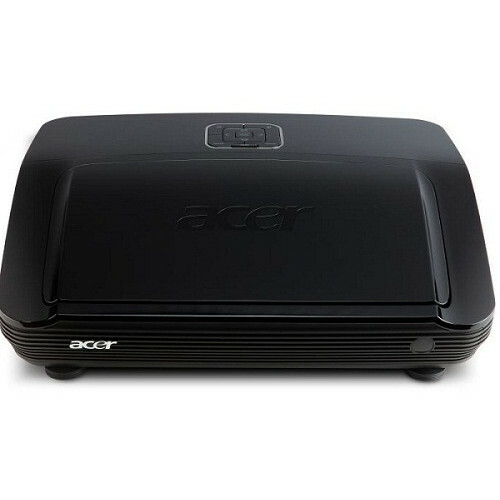 Acer's advanced color technologies guarantee brilliant images and consistent quality despite prolonged use. The slanted housing is perfectly angled for the projection route, and fitted with a special mirror for ultra-short-throw projection. The foldable cover protects the lens from dust and reduces maintenance costs. Crestron® Network System compliance offers projector control over LAN or Wi-Fi®. The HDMI® port lets you connect to HD digital sources. And for PC-less convenience, you can directly project photos and slideshows from a USB flash disk. 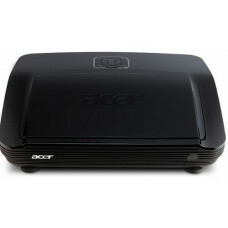 Press the Empowering Key for easy access to the useful suite of Acer Empowering Technology tools. Acer SmartFormat technology offers instant projection of wide-format content. With Acer Instant Pack technology, you can safely unplug the power cord right after the U5 Series is turned off, so you can pack up and go immediately.